My friend Bruce and I had long enjoyed watching the toy boats sail in the Central Park Boat Pond and talked of renting one often but never did. Bruce finally broke down and bought a toy sailboat at an online auction where it was listed as ‘sailable’ when it should have been listed as ‘saleable’. The following Saturday afternoon we headed to the Pond and as we were unpacking we were approached by an older veteran sailor who carefully looked the boat over and helped adjust the rigging and sails. 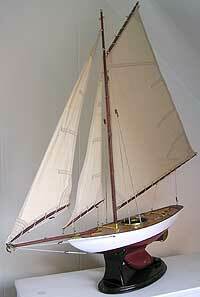 He remarked that this model didn’t have a weighted keel but we could try sailing anyway. Bruce placed the boat in the pond and it did sail… briefly. A strong gust blew the boat over and the cloth sails were soon stuck in the water. A toy power boat tried to help right the boat but mostly only pushed the boat further underwater and was caught briefly in the rigging. After the owner got his boat free he ran around asking for other sailors to try and rescue the toy boat which was floating horizontally just below the surface. There was nothing anyone could do and neither of us looked forward to getting in the water and rescuing the boat. After several minutes of commotion, a toy fireboat (with working waterworks) came sailing up to the rescue and glided to a graceful stop just above the boat. It lowered a (paperclip) hook into the water and easily snagged the sailboat and dragged it to the edge of the pond.